Last night I attended the Southern Blog Society's "Bombshell Bash" in Buckhead. 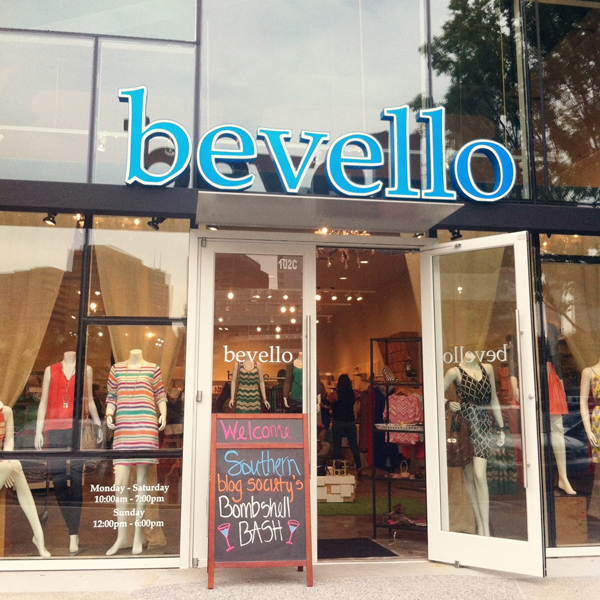 It took place at Bevello in the Shops Around Lenox. I was excited to check out this new store that came to the center after I left my position at Paper Source in the same shopping center just about a year ago (has it really been that long?!) and to meet other local bloggers. I ended up having a good time and met some great ladies but I almost didn't make it in the door. Earlier that day the social anxiety that I have dealt with over the years began to creep up on me. You wouldn't know it if you've talked with me one on one or even in a small group but I get very anxious in certain social settings. I'm fine in an amusement park or ball field but I once had a panic attack in a crowded IKEA. Over the years I have pushed myself out of my comfort zone and for the most part my anxiety has subsided. I still have small "flare ups", if you will, occasionally while driving or when I sense confrontation brewing. I prefer not to talk on the phone but I will if I have to. I push myself to meet new people and establish new relationships. It doesn't come naturally to me. I'm not a hermit by any means. I want to be social. It's just hard sometimes. The internet in general, and blogging specifically, have given me an outlet to express myself freely. I've met so many people and have created so many lasting relationships through this venue. Some say it's limited but I like to think it only helps to expand our reach. That being said, there is a certain anonymity to writing a blog. You may think you know - I mean really know - a blogger by following her life digitally over the years but the truth is you don't. You can't. It's impossible for a blogger to share every single detail of her life with you, even if she wanted to. We overlook things, or don't think something is "blog worthy", or it's simply private. To meet other bloggers in person is a little bit like worlds colliding. To top it off I've been feeling funky lately about my appearance. I recently wrote about losing weight and healthy living only now I'm not doing either. My closet and I are at major odds with very few things to select from that fit me correctly or that I even like anymore. I've basically asked my husband to PLEASE nominate me for What Not to Wear and I will not be offended. (Only now I guess they're retiring that show. Womp womp.) So back to last night. I finally got up the nerve to go. I even did my hair, can you believe it? Ben was in charge of bedtime without me which I have to admit felt a little weird. I kissed my Benjamin's goodbye and traveled down the road to Buckhead. But then I saw the first adorable, dressed-to-the-nines, gal walk into Bevello and I contemplated turning around and going home. Seriously. I'm pretty sure most of the bloggers on SBS are fashion bloggers and a fashion blogger I am not. Oh, I love fashion as much as the next girl. I even did a short stint at FiDM with dreams of someday becoming a fashion designer but my current lifestyle and let's face it, my budget, simply do not allow for the latest trend. (But, oh how I dream.) A quick pep talk from Ben and I made my way through the doors but I didn't know what to do with myself once I was there. I am not used to just walking up to someone and introducing myself. That's random and awkward. Thank goodness someone took pity on me and invited me to join their conversation. Phew. Introductions were made all around and of course I didn't get my cards made on time. A blogger with no way to share her web address? Are you serious? Guffaw. Regardless, here was a way for me to meet, greet, and potentially network and I'll take every opportunity I can to do that. I introduced myself and talked a bit about what I do and of course my blog and something I never in a million years would have expected -- I found myself somewhat apologizing as I said, "I write a mommy blog..." What is that about?! If you've been following me for longer than a year you know that my blog didn't always have this focus. Over the years I've mostly blogged about crafting and scrapbooking with a lot photography thrown in the mix. When I quit my job at Paper Source last year I imagined it would only be until after my son was born. My life has unfolded in so many beautiful ways over the last year and I am blessed with the opportunity to stay home with him. It was then that I decided to focus on my photography business and my blog. I was immersed into Mommyland and as "art imitates life", my blog has naturally evolved into what it is today. 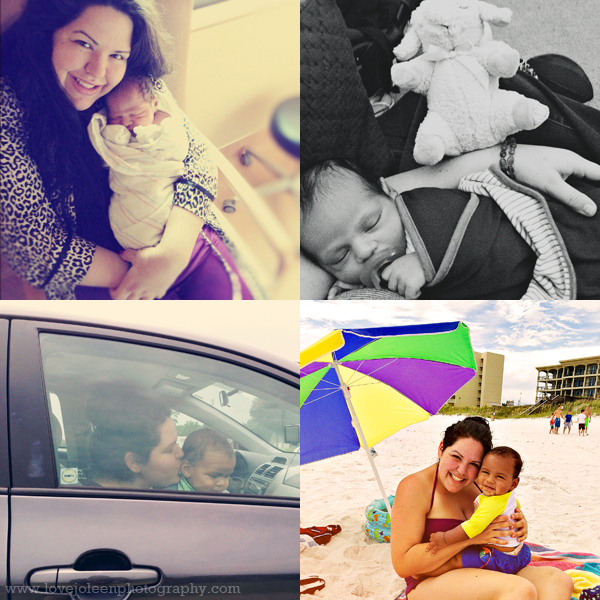 In the last 24 hours I have thought a lot about my blog and what it means to be a "Mommy/Lifestyle Blogger". I absolutely love blogging! I am so happy to share my life as a wife and mother - as we really get to know each other and this great city we live in. I love my readers and the friends I've made through emailing, social networking, and the like. I love networking with companies through reviews and awesome giveaways. I am grateful to all the people who have guest blogged here on Love, Joleen. I thoroughly enjoy putting together wishlists and tips to share. Editing photos to blog and creating graphics is so creatively fulfilling. I couldn't imagine a genre that would be any more fitting for me than this one - to write about something I'm so passionate about, and I'm thankful you're here to share it with.